The Philadelphia Flyers signed Yevgeni Medvedev, who just terminated his contract with Ak Barz Kazan. As a member of Ak Barz, Medvedev was a teammate of Burmistrov. He had some interesting news in regards to Burmistrov as well. This should not really come as a surprise for anyone. Rumours of Burmistrov wanting to come back to the NHL has circled around for years. Last summer Alexander Burmistrov and the Winnipeg Jets carried discussions regarding Burmistrov terminating his KHL contract and coming across the water for the 2014-2015 season. After that did not work out but prior to the season’s start, Burmistrov stated in an Russian interview that his NHL dream had not ended and he would most certainly return next year. So Burmistrov is likely coming across the water, but who is this player the Jets will likely be either signing or trading? It’s been a long while since we’ve seen Burmistrov play on this side of the pond. Let’s take a look at his performance in terms of results, and comparing where he would rank on the Jets 2014-2015 squad. In terms of points per sixty minutes, Burmistrov did not score at elite rates. His production was more typical of an okay third line player or an elite fourth line player. It would place him in below Mark Scheifele and Michael Frolik, but above Adam Lowry and Evander Kane for Jet top nine forwards over the 2014-2015 season. A cursory look makes Burmistrov’s contributions in shot attempts and scoring chances to be just average for the Jets 2014-2015 squad. However, the Jets were not nearly the team at 5v5 that they are today. We get a better handle of Burmistrov’s impact by looking at relCorsi and relSCF%, the Jets numbers with Burmistrov on the ice versus on the bench. Young Burmistrov’s relCorsi rating puts him between Frolik and Lowry for impact. His impact on scoring chances puts him between Lee Stempniak’s short performance and Bryan Little. dCorsi says that Burmistrov destroyed the minutes he was playing and suggests he could handle more ice time and tougher assignments. Burmistrov’s Goals Above Threshold combines scoring, penalty differentials, shot differentials, and faceoffs impact, suggesting Burmistrov’s overall impact is slightly above middle six forward average, and above that of Michael Frolik in 2014-2015. Will Burmistrov come back a more developed player? Most likely. 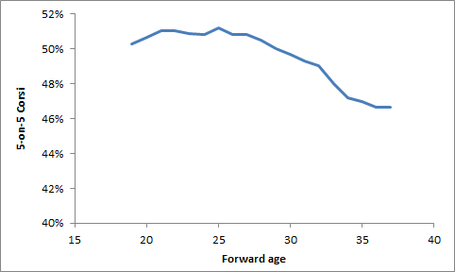 For one, it is incredibly rare that a player peaks at the age of 19 or 20. Now this shows how players perform on average. 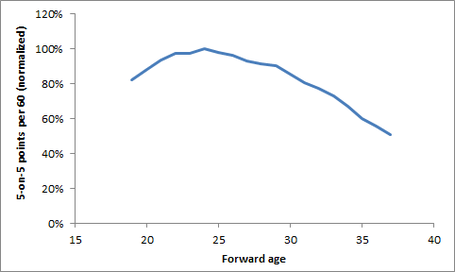 There is no guarantee that Burmistrov follows the same development path as the average forward. The above uses points per game, not points per minute, which has been shown to peak later than points per minute due to coaches impact on ice time. Still, Burmistrov is trending upwards and out performing many of the Jets young promising centres. Using Euclidian Distance at WAR-on-Ice developed by Manny, we can look at which players between 19 and 21 had the closest statistical performance as Alexander Burmistrov’s time as a Jet. The ten closest statistical cohorts (in order of closest to furthest) are 2013-2014 Nail Yakupov, 2013-2014 Zemgus Girgensons, 2010-2011 Ryan O`Reilly, 2013-2014, Charlie Coyle, 2009-2010, Sam Gagner, 2008-2009 Viktor Tikhonov, 2014-2015 Curtis Lazar, 2009-2010 Patrick Berglund, 2014-2015 Elias Lindholm, and 2008-2009 Nick Foligno. Now a good many of these players are not 23 yet, so there is an issue with making expectations. So, we expanded the data set up the first fifteen players to play until they were 23 that were statistically closest to Burmistrov’s young seasons. From their salary and the cap at the time we can get an estimate of what the average player should who performs like Burmistrov would be paid under a 70 or 71 million Salary Cap. The number comes out to a salary of 2.8 to 2.9 million dollars. Of course, Burmistrov has been gone from the NHL, so their is an added unknown element. Because of this, we should expect Burmistrov’s salary to likely drop somewhere between 2.0 to 2.5 million to account for the risk. In terms of on-ice value, the answer is keep 100%. As noted above, Burmistrov improves the Jets probability winning by a substantial and significant amount, despite not being an overly effective point scorer. Burmistrov’s primary source of value is in his impact on shot differentials. Because of his prowess in these numbers, he becomes a greater positive impact than Drew Stafford or even Michael Frolik. The issue is that the trade and contract markets are predominately dictated by scoring. Burmistrov was a highly valuable player in terms of helping a team win, but is not valued by GMs in the trade market. In other words, the Jets will likely lose value with Burmistrov’s return from trade. This does not mean that Burmistrov should be kept in spite of other possible flaws. If Burmistrov cannot play with the Jets current set of players, he cannot play with them. There are some overly critical opinions out there. Burmistrov’s legally-fair-by-NHL-rules decision to go to the KHL should be judged the same way as one would see a free agent sign for another team due to more money and expanded opportunity. However, there are conflicting reports on Burmistrov’s character. We know that Burmistrov did not see eye-to-eye with Claude Noel, but we also now know that was true of many of the Jets players. We also know that the Barrie Colts organization raves and praises Burmistrov for his attitude and character. Whether it was something that is a real issue with Burmistrov or an isolated event due to circumstances remains to be seen. Seriously, what does any of what you wrote have the slightest to do with Burmistrov as a legitimate NHL hockey prospect? Maybe him coming to the NHL next season. Or maybe the fact that he has impacted teams at only 19 in a significantly positive manner. Or maybe that he compares to some really good players. 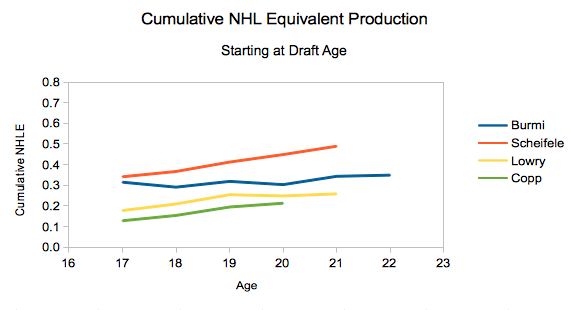 Could be wrong… Maybe that doesn’t have to do with Burmistrov as a NHL hockey prospect haha. The Jets should trade Burmistrov, if the right offer comes around. He has no heart, and that is a major intangible that stats do not tell you. He will be out of the NHL by the age of 26. Question, when the intangibles do not effect the results (stats), are you sure you are right about them? After all, you should only care about intangibles when they impact the results. The game is about out scoring your opponent. How much do intangibles matter when the more intangible player gets outscored and the lesser does not? I’m thinking the Burmistrov situation would be best served by having him on a one-year, two-way contract, even if the Jets have to pay the going rate of a player with his stats. Burmistrov is two years older, the team management has changed dramatically (which was the main sticking point), and the team’s style itself has changed. He might be a fantastic fit, he might be a terrible fit. A short contract to feel each other out is the best way to handle this. As an aside, I think the contract will end up a bit lower and probably one-way, but I’m OK with that if he’s slotted into the 4C position. At best right now he’s still behind Little, Scheifele & Lowry in the franchise’s depth chart and that doesn’t include serious contenders like Copp & Petan. It will not be anything but one way, since Burmistrov would have to go through waivers to play in the AHL and so there is no reason to make his contract have an AHL salary incase he plays there.